The owner contacted the Southern Wisconsin Paranormal Research Group (S.W.P.R.G.) because he was having subjective paranormal experiences that have been increasing in intensity. The client is 48 years old and lives with his 84-year-old father. They have lived at the current location since July 2000. The client reports that he suffered a back injury in October 2005 with associated nerve damage. The paranormal activity has prevented him from sleeping well at night. Heard moaning and a demonic laugh. The client feels as if the entities are out to ‘get him’ and he is worried about his health. He has previously spoken with a Catholic priest about his experiences and has had the house blessed. He reports that the activity decreased for a very short time after he had the house blessed. It has since returned in full force. All sound data was digitized and processed using Adobe Audition 1.5, Goldwave, Raven, and Audio Cleaning Lab 3.0. Go!Motion Vernier ultrasound motion detector with supplied Logger Lite v1.3 software. The equipment was setup in the main room, hallway, kitchen, and client’s bedroom. Surveillance cameras (IR DVR and DV cameras) and D.E.A.D. system were placed throughout the before mentioned areas. Ion counts, gauss meter readings, and radio frequency analysis was done. Various data sweeps were done throughout the location. Investigator personal experiences were recorded. EVP sessions were conducted in the client’s bedroom. Nothing of note was seen in any of the video footage during the full investigation. During the pre-investigation, Dave and Heather saw what appeared to be a flash of blue light in the main room and dining room area. Review of the video recorder tape showed a flash of light that appeared to be from the outside due to the fact that the pattern of the window blinds was seen on the wall where the video was pointed at the time. 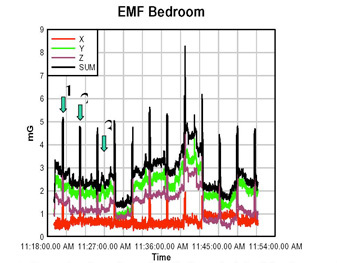 Baseline EMFs were 2.0 to 5.0mG with much variability. Two potential EVPS were recorded during the EVP session. One EVP was determined to be an investigator taking a deep breath and therefore discarded. The other potential EVP is still being analyzed. Dave smelled what seemed to be a rotten flesh odor during the pre-investigation visit. It lasted about 30 seconds and the EMF went from 3mG to 10mG during this experience. Also during the pre-investigation, Heather experienced the feeling of something touching her hair. The personal experiences during the full investigation are discussed below in the D.E.A.D. system data since there were changes in the EMF that correlated with those experiences. The pictures of the scratch on Jen’s arm and Heather’s hand are below. The redness from the scratch is seen despite the rather poor quality of the pictures. The cause of these scratches is currently unknown. There was nothing of note in regards to the radiation, temperature, humidity, or light intensity. 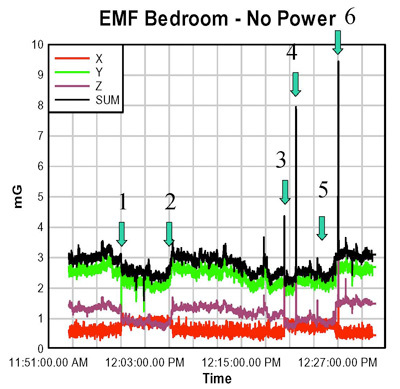 There was a variety of interesting EMF data. There was a 10 second pulse approximately every 3 minutes (which would translate into a 0.0055Hz pulse in the static field). 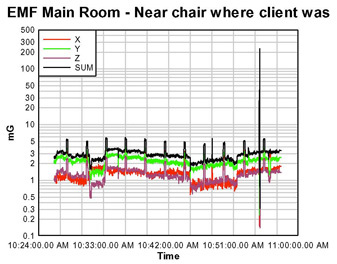 The client reported ‘something’ approximately 70% of the time there was an EMF pulse. One can also see that every so often there is a decline/dip in the overall field. The blue arrows indicate when investigator Jennifer Lauer had the following experiences: the sensation of being touched; sees a light sparkle; and her hand is scratched. The decline and rise in the overall field is seen again. Jen feels something on her face. Once again the decline and rise in the overall field is noticeable. 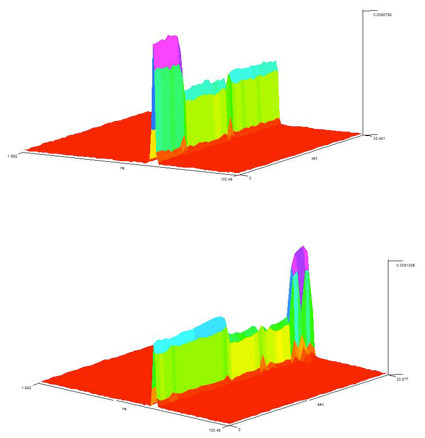 This data was collected with the power to the client’s flat turned off. However, the power to the second floor flat was still on. 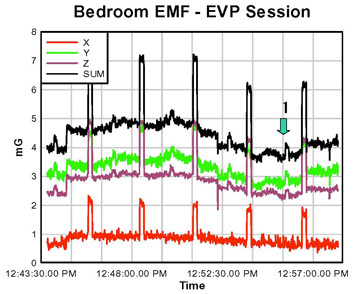 The ‘spikes’ in the EMF are less numerous and more variable but are still present and do correlate with personal experiences by various investigators. The graph above shows the EMF data collected during an EVP session when the power was on. Yet again, the decline and rise in the overall EMF is noticeable. The arrow shows when investigator Heather’s face began to hurt. 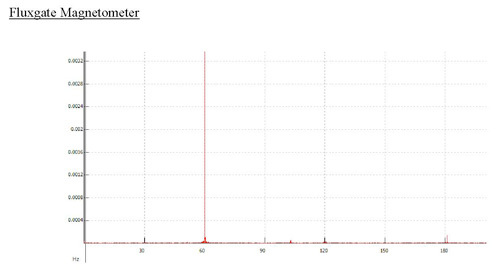 A strong 60Hz signal is evident in the graph above. FFT analysis of the fluxgate magnetometer data shows a more detailed view of the rise and decline in the overall field as well as the 10-second ‘pulse’ that occurred every 3 minutes. It is evident above that there is considerable amplitude variability in the 60Hz field over a given time course. EMF amplitude and frequency changes have been noted in other investigations of ‘haunted’ locations (Braithwaite and Townsend, 2005). Other research has implicated that low frequencies are important for triggering neurophysiological shifts and invoking experiences in individuals (Bell et al.,1992; Bell et al., 1994; Randall and Randall, 1991; Persinger and Koren). Naturally produced geomagnetic fields have also been implicated in reports of anomalous activity (Persinger et al., 1973; Persinger and Koren, 2001; Roll and Persinger, 2001). In addition, magnetic field variability in the 11 to 15nT range has been detected in locations where people have reported paranormal activity (Wiseman et al., 2002; Wiseman et al., 2003). Even though the pulses are created from the 60Hz field, it could be detected by the brain as a change in the static field (Braithwaite and Townsend, 2005). Even though AC fields are not complex magnetic fields, they can be complex in the fact that they vary in time and amplitude. Tingling (somesthesia) and numbness (paresthesia). Typically occurring in the extremities and eyelids. It has also been shown that stimulation of the septal area in the brain can lead to sexual sensations (Simpson & Fitch, 1988). This information should be taken into consideration because of the type of experiences reported by the client and the complex electromagnetic environment in which he lives. The electromagnetic sensitivity of the client was explored using ‘The 25 Questions’ and ‘Reiter’s Magnetic Response Test.’ There is no indication that the client is electromagnetically hypersensitive. A paranormal causality of the reported phenomena can also not currently be ruled out. Various investigators had experiences during the investigation that cannot be currently explained. The reported phenomena and the environmental readings are consistent with that reported in other paranormal cases. The client also reports that the phenomena ceased temporarily after he had his home blessed. He is going to have his home blessed again and would be interested in a cleansing/clearing. He will also do his own home blessings. No conclusion can be reached at this time. Further investigation is needed. We will continue to work with this client. Budden, A. (1998). Electric UFOs: Fireballs, electromagnetics and abnormal states. London, UK: Blandford. Simpson & Fitch. (1988). Applied Neurophysiology. Butterworth.